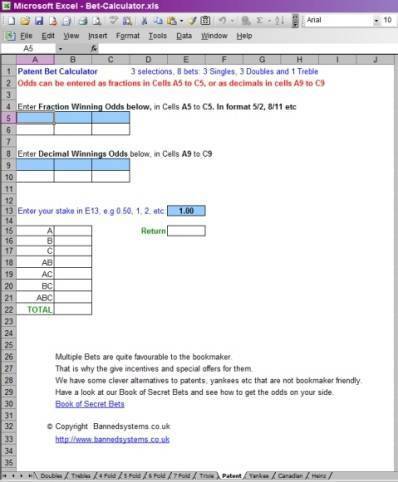 We have developed a spreadsheet that calculates the returns from doubles, trebles, 4, 5, 6 and 7 fold bets, also trixies, patents, yankees, Canadian and Heinz bets. These types of bet can be difficult to calculate. Now you can be sure that the bookie is paying you correctly! Available as a free download. We don't really like full cover perms and have some clever alternatives to Yankees etc. Have a look at our Book of Secret Bets for bets that are not so bookmaker friendly. 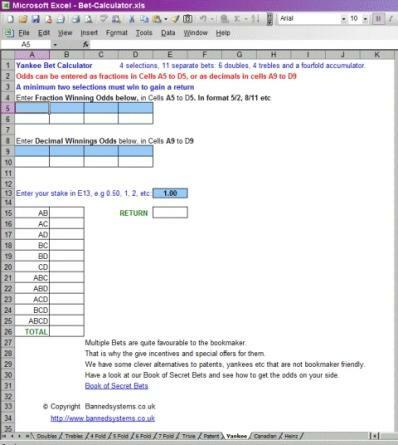 Here are screenshots for the Patent and Yankee calculators.